A: First, don't worry, you can email us,email to us will be faster.This is important. 【Four Loudspeaker Diaphragm】Built-in Subwoofer Multimedia Speakers,The laptop USB speakers deliver powerful sound for your computer, PC, Echo Dot, monitor, smartphone.you can not only get clear audio but also high and low sound all easy access. The volume can go pretty high which good for cinephiles and misic lovers. 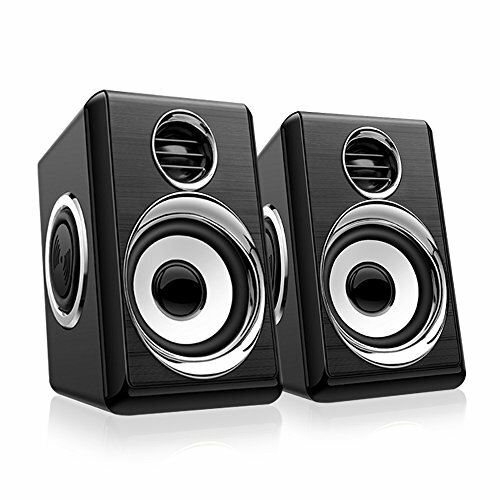 【Computer Speakers USB】USB Powered and 3.5mm Audio Input,Plug and Play,Plugs directly into your computer so you can take them with you.The compact design allows the speakers to easily sit on your desk. 【Compact Design and Volume Control】: Save desktop space,On-speaker volume,One Finger Control,Turn the speakers on and the volume up with one simple control for quick access. 【Stylish Modern Metallic Paint Screen】 It's compact, modern design adds a sleek, unique look with an impressive sound performance to match. 【Anti-interference Technology】Simple Set Up,Just plug the USB cable into your device or the wall and plug the 3.5mm jack into your audio device and you are set.,Support Pad,Pod,Phone, Mac; comparable Android-based smartphones and tablets; Kindle Fire, Nexus, Microsoft's Surface; MP3/HD radio sets and Windows-based laptops, netbooks TV, and PCs. If you have any questions about this product by BeBom, contact us by completing and submitting the form below. If you are looking for a specif part number, please include it with your message.